The genesis of a building comes from many places – the function it is to accommodate, the context that surrounds it, the aspirations of the owners and inhabitants, and the creative juices of the design team. When they come together they sing, engaging both the surroundings and the people enveloped within its spatial confines. 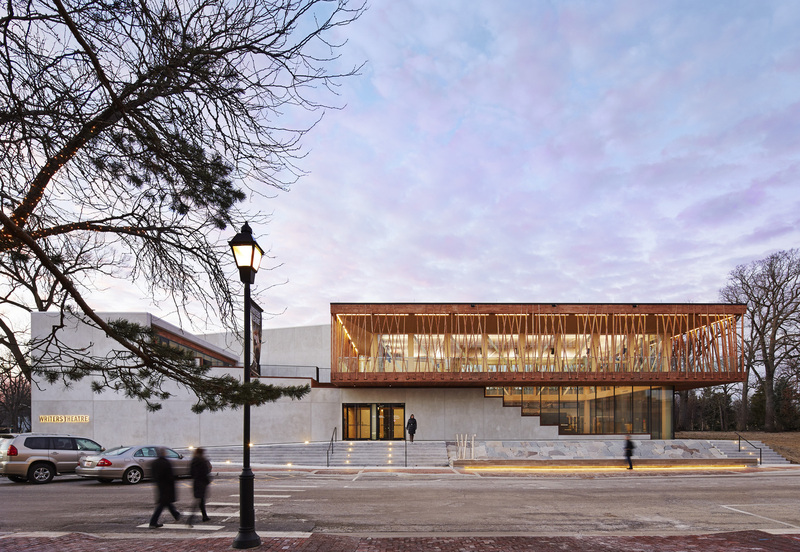 The Writers Theatre sings, and not only because of the performers within. With a main theatre, black box theatre, library, terraces, and an airy lobby that doubles as yet another performance space, there’s a lot going on within. Yet it remains low scale and low key, with a nice arrangement of forms that blends well into the parkland and residential buildings that surround it. There’s an economy of figure at play in the building, using simple moves of rising (and falling) geometry to break the building down without becoming disjointed. It also works to create connection between the different scaled parts of the building – two story volumes vs the single story spaces – with gradual transitions that prevent any part of the building from becoming overwhelming or seeming like an awkward appendage stuck higgledy piggledy onto the building. It’s a simple and economical material palette, handled with a care that makes it seem much richer. As nifty as the performance spaces are, the lobby is perhaps the most dramatic of all the spaces, one that is almost a performance in of itself. Big glass doors can slide open to reveal a 50 foot wide opening, all supported and further illuminated from above by an outdoor walkway that is both expressive and ingenious. The delicately carved wood members form a rhythm as they march around the lobby volume, playfully intersecting and bowing as they create a balcony that is a delight to walk through. It’s a grand entrance and, connected to an adjacent terrace, another venue open for performances, gatherings, and more. 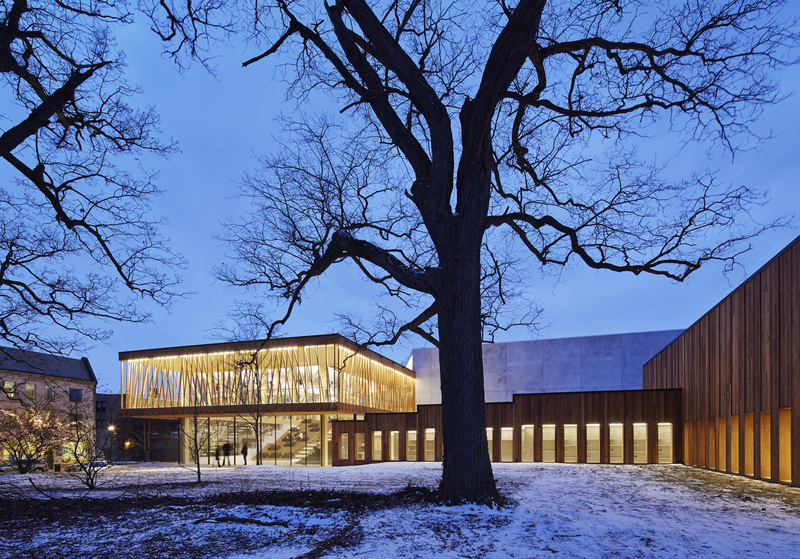 Designed to fulfill many roles in the community, the Writers Theatre has done just that. There are a couple of spots that are a bit awkward and seem underdeveloped, but overall it manages things quite handsomely with a touch of panache. 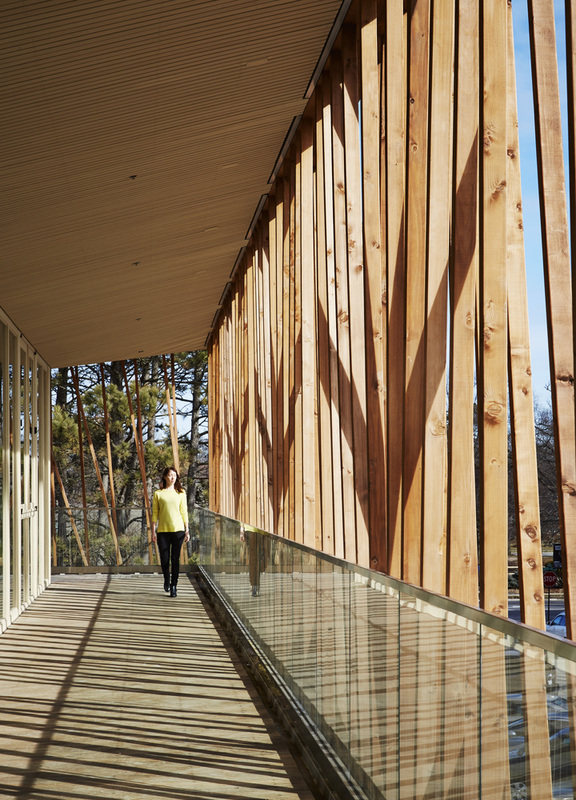 A playful building to house plays, and more.